I use a MongoDB database to analyze data extracted from logs on Linux production servers that handle hundreds of thousands of users per day. I also have databases that I use for research topics – oriented around K-12 education. I have pulled data from The British Library and various datasets from the Europeana Collections. 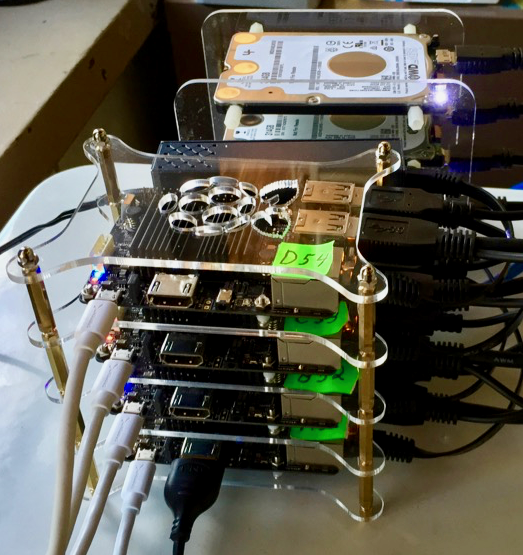 I’ve blogged before on MongoDB running on a 4 ODROID C2 SBC Cluster with external SATA drives — see this post. I had tried both Arch and Ubuntu flavors of Linux. I pointed out then that MongoDB had an official Enterprise Server Version 3.6 for Ubuntu 16.04 ARM 64. MongoDB Release 4.0.6 is now available for download (as of 15 February 2019). Please check the license terms of the “Enterprise Server Version”. There is also a “Community Server” version that might better meet your needs and/or avoid restrictions. The Community Server install is what is described in this post. I assume you have not installed MongoDB in any form before this setup. If you have installed, do a complete backup (dump) of databases and remove the MongoDB and utilities installs as well as all associated directories and files. Add a MongoDB list file from the “xenial” branch as MongoDB 4 is not yet in the “bionic” branch. Update the packages list. Install any updates and then install MongoDB. Note that “lincurl4” replaced “libcurl3” in Ubuntu 18.04. We need to revert to “libcurl3” for MongoDB 4.0 to install correctly. A simple “apt-get install” will do the trick.